Three very general pieces of advice. One, give yourself lots of time for group work. Two, practice several times before using this feature. Three, take time to clarify instructions at the onset: verbal and visual. · Went over the small group activity, directions and various individual group member roles. · Practiced moving from the main room layout to the small group layout. 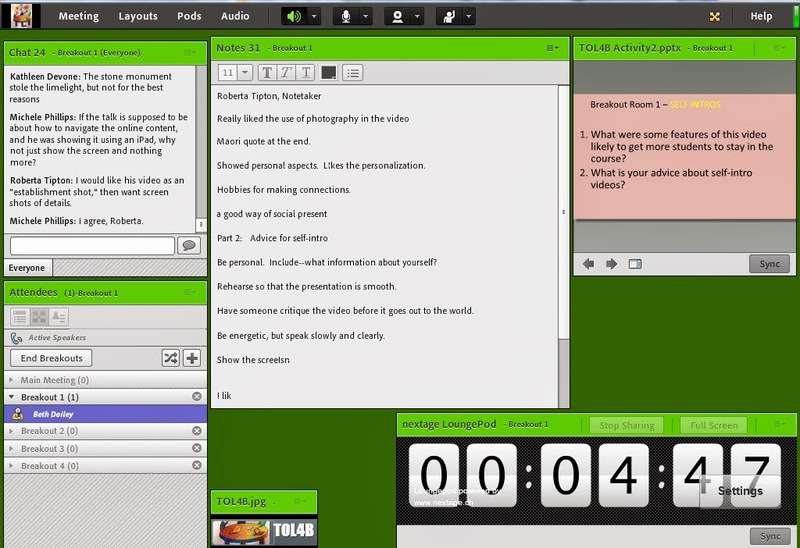 · Work with the facilitators so they also know how to send the host a chat message while within the breakout session. NOTE: The best way to get the facilitators into groups is for them to be presenters before moving breakout groups. Adobe will distribute each to a different breakout room. Participant Orientation to New Features/Functions Include some practice activities and or demonstrations using features that may be new to participants such as writing on the Note Pod and activating microphones. Participants become presenters when moved into breakout groups. This gives them the ability to use the microphone. You may also want to develop and review guidelines for regulating conversation especially if the group is large and if many have mics such as raising your hand when you want to speak. Activity Directions and Breakout Room Functionality Review activity directions with the large group in addition to including a slide with those same directions which will display in the breakout rooms. Explain how the groups were formed, random or selected. Random is the easiest and fastest way especially for large groups. Warn the participants before sending them into groups. Breakout Room Layout I like creating a separate layout for the breakout room activity that You will need to use very large font (30 -32, at least) because the pod will be small.) The chat pod was used to facilitate discussion for those without microphones. The Note Pod was used for the note taker/reporter to capture the highlights from discussion. If you include a place for the reporters name at the top it will be quicker during the report to assign mic privileges to the correct person. I am still experimenting with how to get the timer to work. I think a countdown timer will help the groups manage their time. what the groups will be doing. Below is the format we used. In addition to the chat, attendee and note pod, I included a share pod where I uploaded a slide with activity directions and participant roles. The first step is to select the breakout view from the Attendees Pod. You will then see the number of breakout rooms. Three rooms is the default. You can add additional rooms by clicking the button. You can also click and drag individuals to different rooms. This can and should be done prior to starting the breakouts. Step three. If you have a specific breakout room layout bring that layout up BEFORE moving into groups. The groups will experience the layout applied before moving into groups. button. The hosts will remain in the main room and can move themselves into various breakout rooms. It is good to check back in the main room periodically. If someone comes late to the session, they will enter the main room and you can then move them individually into a room. 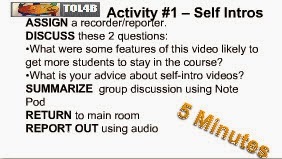 Breakout Room Activity You may want to have a back-up reporter and several back-up facilitators just I case. Ending the Breakout Session You have the ability to send a broadcast message that will be viewed simultaneously by all groups. It is good practice to give a five minute and 1 minute warning. Group Report Out When the groups report out you can open their white board while in the main room so they can refer to their written summary. You will need to give mic privileges to the reporter. If the reporters names is at the top of the Note pod, this will be faster. 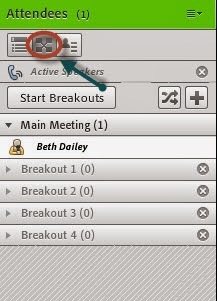 NOTE: If you are sending the participants back to the same breakout groups, simply press the Start Breakouts button. If you want them in different groups then press the random button. Great resource! Thanks Beth. Learning lots from you. Question, what if I need to do several different breakout room activities? how do I manage the different layouts for each activity?